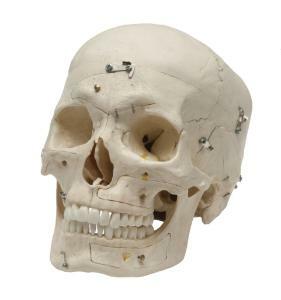 A select human skull was chosen as the model for this re-creation. 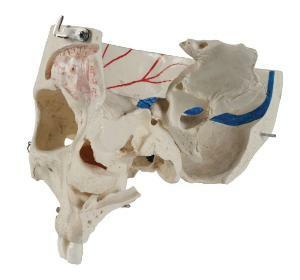 A horizontal section of the skull exposes the cranial cavity where the vessels, venous sinuses, and internal carotid artery are indicated. A sagittal section offers a further view of the sinus cavity and the frontal sinus is dissected on one side by a bony section, while another side reveals it resected in outline. Fully examine the internal ear through a sectioned, removable temporal bone. 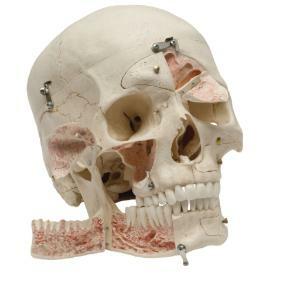 Complete investigation of the teeth with dental nerves and vessels is also possible by opening the mandible and maxillae on one side. The opposite side of the maxillae can be opened by means of a hinged bony window.